At the beginning of October, the packaging print shop Warneke Paper Box invited more than 60 visitors from the USA, Canada and Mexico to Denver for an open house showcasing its new Primefire 106 digital press and its impressive capabilities. 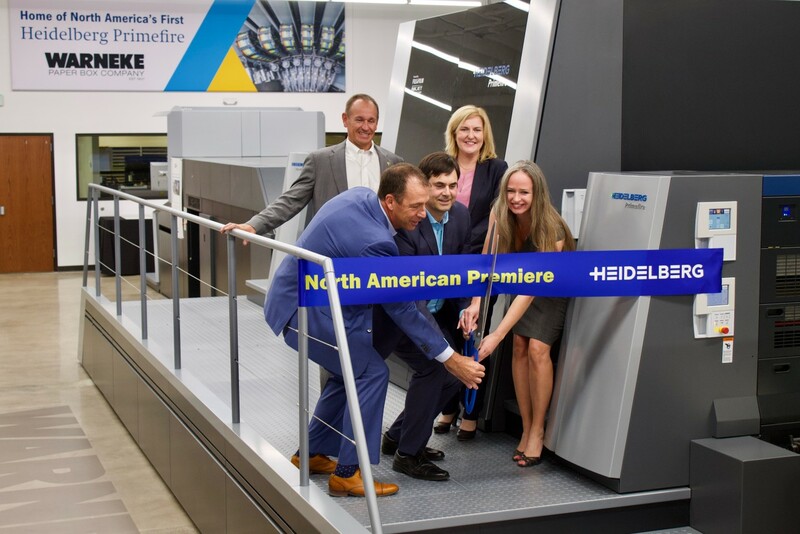 Warneke’s Primefire is the first digital printing system in B1 format in the USA and worldwide is the first standard-production machine delivered by Heidelberger Druckmaschinen AG (Heidelberg). Delivered in July 2018, the Primefire prints top quality with a resolution of 1200 x 1200 dpi, and boasts a wide color gamut and stable color consistency. Founded in 1907, Warneke Paper Box Company is one of the highest-quality custom manufacturers of folding cartons, set-up/rigid boxes, point-of-purchase displays, pocket folders, and cannabis packaging. For well over 100 years, it has provided a combination of production, quality, turnaround time, reasonable price and customer service. Located in Denver, Colorado, in the shadows of the Rocky Mountains, WPB serves not only local customers, but nationally as well. Its exceptional and complete service not just boxes, is significantly present in Arizona, New Mexico, Utah, and beyond.